The awesome Mari Mancusi has a new series forthcoming, this time featuring dragons! I am so incredibly excited for this book, and now I've got the cover here for you guys! So first, let's get to the GORGEOUS cover! Uhhh yeah, I freaking adore this cover! Cannot wait to read! About the Book: Sixteen-year-old Trinity Brown is used to her grandfather's crazy stories, so she never believed the latest treasure he brought home was a real dragon's egg. 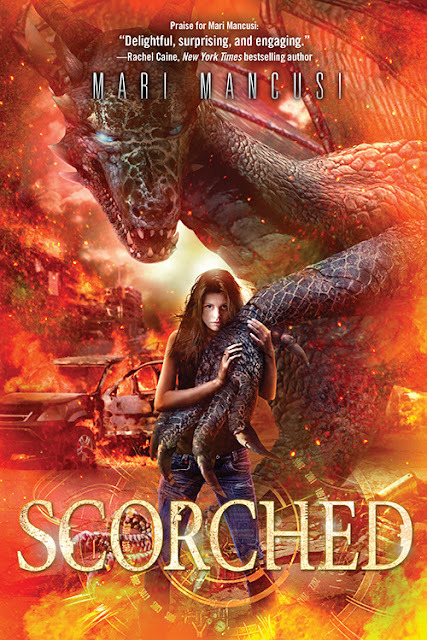 Not until their home is invaded by soldiers trying to steal it and a strange boy who tells her the world as she knows it will be wiped out in a fiery dragon war—unless they work together to stop it. Meantime, there's a different voice whispering to Trinity, calling to her, telling her what to do...the dragon inside her egg is not ready to give up without a fight. AND, you can enter here for a chance to win an early copy plus add it to your GR shelf! Want to read the first chapter? I thought so. Here you go! They came at noon, black shadows dancing across the sky, drowning out the sun. Their cries echoed through chambers and courtyards. Their fire blazed down narrow streets. Some dropped to their knees in prayer. Others tried to flee. But in the end, they all fell down—-ashes choking their lungs, flames singeing their flesh. There was no place to run. No place to hide. And when they did…you would surely burn. Connor’s eyes flew open. Blinding white lights barreled toward him at breakneck speed. No time to think, he hurled himself to the side, adrenaline igniting the reflexes he’d honed in boot camp. A bright blue metal monstrosity shot past him, wailing an angry protest in its wake. That was close. Too close. Sucking in a breath, he crawled up onto a nearby platform, trying to gain his bearings. Shiny hunks of metal machinery—-like the one that had nearly crushed him—-lined the road, dark and silent, while others cruised by, determined white lights chasing brilliant red tails. They reminded him of something he’d once seen on the Surface Lands. Cars, his father had called them. Of course they looked a lot different when living, breathing, and not caked with rust. But that meant…A smile crept to his lips. “Well, what do you know,” he murmured, drawing in a lungful of the freshest air he’d ever breathed in all his seventeen years, with zero smoky aftertaste. It was crisp. Colder than they’d predicted for August in Texas. So cold, in fact, he could see his breath reflected in puffy clouds as he exhaled. Shivering a little—-his travel jumper was definitely not made for this kind of weather—-he found himself gazing up into an open sky littered with stars and anchored by a bright, full moon. The vastness of the universe unabashedly spread out before him made him a little dizzy. “Get away from my kids, you freak!” Mom was now on the scene, waving one hand threateningly at Connor, the other fumbling at her coat pocket. For a split second, he feared she was reaching for a weapon. Instead, she pulled out a small, black plastic device. Some kind of primitive transcriber? “Please,” Connor pleaded, taking a few steps backward, his mind desperately searching for a rational explanation for the canister falling from the sky—-preferably one that didn’t require prior knowledge of quantum physics. He was supposed to be blending in, not making a scene. He wasn’t exactly off to an auspicious start. His eyes lit upon an open window, two stories up, red--checkered curtains fluttering in the night sky. “My…girlfriend,” he stammered, his mind reaching for the proper terminology as he waved his arm in the direction of the window. “She tossed me out.” He gave the woman his best sheepish smile, then held up the canister. “Told me to take my gear and never come back.” The woman narrowed her eyes, staring at him for a moment, then up at the open window. Connor realized belatedly that she could very well know the girl who lived in the apartment above or know that there was no girl to begin with. This wasn’t like back home; people here knew their neighbors, shared cups of sugar—-that sort of thing. Had he just made a huge mistake? But it was no use. The trip had left him completely depleted. And he had no idea how long it would take to regenerate his spark. He’d be forced to do things the old--fashioned way—-at least for the foreseeable future. “Her name,” the woman repeated. “Your girlfriend who threw you out. Does she have a name?” She gave him a pointed stare, as if daring him to answer, her fingers still hovering dangerously close to her transcriber. The woman’s eyes bulged and a small squeak escaped her lips. Staggering back, she held up her hands in surrender, her transcriber falling from her meaty grasp and clattering to the pavement below. Her children screamed, latching on to their mother, their innocent little faces mirroring her terror as Connor narrowed his eyes, doing his best to look desperate and dangerous. As if he were the type of guy who shot down mothers and children in cold blood every day before breakfast. Connor sighed, lowering his gun. And…so much for blending in. I’m the good guy, he wanted to add. The one they sent to save your world. But of course he couldn’t tell her that. It would just bring up too many unanswerable questions. And he had to get a move on anyway—-catalog his gear, get changed, locate the museum. Do a little preliminary scouting before introducing himself to the girl. He had a lot to accomplish in the next four months—-before the Reckoning day—-and, as his father would say, there was no time like the present. Yeah, like that was going to happen. He could tell from the look in her eyes she’d remember this incident till her dying day. Her children too. But it couldn’t be helped, he reminded himself. And they would thank him if they knew the truth. They would get down on their very knees. Connor had started to walk away. But the woman’s words made him pause. “Wait, what? What did you just say?” He turned back to her questioningly. The woman stared at him, as if he’d lost his mind. But it was, he realized. The signs had been there from the start. August in Texas—-it should have been a hundred degrees out—-not cold enough to snow. “I was supposed to have four months!” he cried, looking up at the woman with wild eyes. She gave him a helpless shrug, then turned and fled down the street as fast as her thick legs could carry her, her kids scrambling to catch up. Connor watched them go, suddenly feeling as frightened as they must feel. But for a very different reason. “I was promised four months,” he whispered to no one. …and saved his father’s life. Or the apocalypse that ripped apart his world would begin…all over again.